[Updated] Housekeeping staff at The Reefs have walked off the job after three colleagues in the maintenance department were made redundant this morning [Nov.7], Bernews understands. 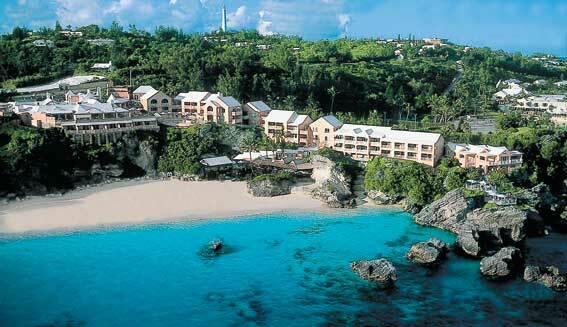 Talks between the hotel’s management and the Bermuda Industrial Union are underway,. The work stoppage comes as hotel staff are today being informed about plans to scale back operations this winter so extensive renovations can get underway. The project will begin January 2, 2012 and be completed by March 15 in time to welcome guests for the spring season. Walk off the job? That’s a breach of contract – see you later. There’s lots of people that would take that job, even if its only until January. Get your big heads out of the sand, walking off the job when you have hundreds of Bermudian un-employed takes balls. The day is coming and coming real soon reality is going to show it’s ugly face and bring this sense of entitlement to it’s knees. But don’t they close every year around this time for renovations, etc.? The staff are acting like this is the first they have heard of it. Winter closures were one of the reasons Bermudians began to move away from the hotel industry, because so few were able to budget their money during the year to cover those months when the hotel was closed. I clearly remember my father going to work in Jamaica for half the year because the hotels were closed during the winter season. I also remember that Pink Beach would hire those staff that were willing and able to work on the refurbishments. This was a life saver for those with families to feed. and he had what was considered a good position back in those days. Winter layoffs and closures were normal and the staff prepared themselves for it and many did home maintenace jobs in the winter to get by . And they did .. quite happily , too . The difference is that the cost of living was in line then and money was worth something. “In 1966, frustrated by racial prejudice and the practice of hotel owners employing overseas musicians on contract at the expense of local musicians, (Lance)Hayward moved to New York, leaving his family—including children Stuart and Sylvia—in Bermuda. I am constantly amazed by the stupidity of some Bermudians. The sense of entitlement is staggering. If I was Dodwell I’d say come back to work tomorrow or don’t come back at all. 12% unemployment, on the brink of a long dark penniless winter, and you fools walk out. You deserve to be fired – you are too stupid to have a job. Dodwell should do what you suggest but the Big Bad BIU will then shut down the whole island and make things even worse. The good news is that things can’t keeping getting worse for much longer before they hit ROCK BOTTOM! ROCK BOTTOM would be good and then they can collect $50 a week from the almighty UNION. Don’t have a stroke I understand,its you white friend Dodwell hotel,if a black man own the hotel you would not give a shhhhhhhhh about those workers so sad. And they will be the first ones to complain when their jobs will be filled by Indians or Philipinos.. The stupidity of Bermudians, BIU members in particular, never cease to amaze. Since 1981 they have managed to strike tourism just about right out of existence. The hotel division of the BIU is barely a shadow of its former self yet still members want to be as arrogant as ever. They fail to understand that they are not entitled to a job. The job is there because human labour is needed to make the hotel machine work. If fewer humans are needed, the jobs disappear. Simple. The UBP moved away from Tourism only to focus on IB. You have no idea what your talking about. The usual claptrap from the ignorant/misinformed. Did the UBP own any hotels to close back then ? Did the UBP tell the airlines they couldn’t bring tourists to Bda any more back then ? Did the UBP shut down the Dept of Tourism and eliminate it’s budget back then ? While the UBP facilitated in growing another industry the BIU and it’s antics which led to terrible attitude problems and no value for money killed tourism. And I’m not a big fan of the UBP …Just a little factual history lesson for you. Go & have another helping of koolaid. Walking off the job? Fire them and let them suffer along with the rest of us. In a role where you are highly expendable and replaceable in about three days, suffer. walking off the job in this climate…………..they need not come back, at a job fair there were hundreds of people looking for a job, dont these people get it………… they should be told not to come back and hire a whole new lot! Instead of letting go 5 foreigners they would rather let the 3 Bermudians go. Because the natives are lazy. Because I know so many hard working, well-educated Bermudians, I can confidently say that your statement is a lie. You are labelling an entire nationality on the basis of your few personal experiences. This makes you either prejudiced, uneducated, ignorant or just a simple liar. Perhaps you’re all four rolled into one abnoxious combination. If I only knew your nationality, I could then, by your school of thought, claim that they are all just as poisonous as you. Say Ftm is in fact Bermudian and has an unpleasant perspective based on his or her realities and experiences ? Are Bermudians not allowed to have unsavoury opinions too ,or is it only ‘foreigners’ who are believed to be the only ones able to say things some don’t want to hear ? Walk off the job and don’t come back because this is insane! Why would people do such a thing like this in these economic times? There are lots and lots of other BERMUDIANS that are unemployed and looking for work. I just hope they stop the foolishness and come to their senses before it is too late. Quite frankly, you lot are doing a pack. Those of you who have a problem with them downing their tools just a point of clarity…Are you saying that just because we are going through a recession than we should lay down and except whatever is thrown our way? 3 Bermudians have been let go..and foreigners remain and this is acceptable? and it’s not a sense of entitlement either its called principle. Now I wasn’t at the meeting ( I work there part time) and I don’t exactly know what’s what, but those of you that have posted seem to have some inside information so perhaps you can fill us in..
We are in a major economic downturn and the reality is that at times we have to take it as it is. Maybe the way they were let go might not have been the best, but let’s be real… a strike?! These workers are hurting themselves and Bermuda as a whole and don’t appreciate that they have employment. I’m sure there are other ways to support their colleagues without immediately downing tools. Now, once again, Bermuda looks stupid and our fragile economy gets another blow. Let us keep up these wildcat strikes and our hatred of foreigners… then we will all see how bad Bermuda gets, and then those same workers will be complaining that they can’t find a job! no one cares about fairness, unless it’s happening to them. injustice to one is injustice to all.. Walking off the job is just so Bermudian. It’s this native sense of entitlement. They believe that it is their right to have a job, turn up when the want, do shoddy work, knock off early and accept no complaints. The chickens are coming home to roost on this island and I have news for the public sector. No union can save you. When the international business all board the boeing, your apartment rents will go from $2000 a month to $200 . It’s coming just watch!! with your attitude I hope you are on the boeing…..when it leaves…..won’t want you to suffer any…..
after 30 years (all my life) here…its time to say screw it all. agreed. i have worked at a local hotel for a year…. the attitudes of some of the bermudian staff was just horrendous. For a hotel that is trying to rebuild its reputation, when you have housekeepers shouting down the hallway at 9am about who’s friend is going out with who, and who went out last night… its just embarrassing. And this is just one minor example… bermudians seem to have lost the art of hospitality. Yes. Fire the mongrels! Look, expats working there or not, the maintenance men had to go. Let’s see what alchemy bro. Chris conjures up for this lot. Sheesh. Fools the lot of them . Redundancies generally come with some sort of pay-off . But let them walk off the cliff cause there will be no calvary coming to save them . All other divisions will turn their collective backs on them . Everybody is sucking salt right about now . Not everybody is sucking salt check around you may be, but others are sucking sand. No they are sucking Koolaid believing it will pay their bills. Please get all of your facts straight while you lot on here calling people names and don’t even know what the hell went on just people looking in from the outside please know the whole story before you start talking about people and nobody walked off of the job they just sat down so all that talk bout whoever walked off don’t let them back well they never went anywhere so they can’t be let back ok like I said please know what and who you are talking about before u just start talking just like BERMUDIANS hear one thing and run with it and every body is in titled to an opinion and if theirs was to sit then so be it, it isn’t any of you..GET A LIFE!!! Hey,put a period (. )in there somewhere so I can catch my breath. World record run on sentence. I wonder if Bermuda could ask for a bailout before the the money drys up. Seems they want the hotel to keep paying the workers in question when there is no job. Getting paid to do nothing? Is that the Bermudian way or simply the Union way? These Reefs people must think they get paid with a Government check or something. Everyone knows that a Government job is the only one where you can get paid to do nothing. Better still, you can walk off that job to go to a meeting & there are no consequences. F… all you idiots who think that they are high and mighty. If they chose to strike that is their option. Tired of you lot calling Bermudians names. If you dont like it take the next thing smoking and get the f… out. I am so with you…..They drank their own spiked kool-aid,and can’t stop vomiting vile. It you all hate Bermuda so much why are you here hurting yourself, you add nothing of value. Do us and yourself a favour and find another place to live and or blog…just remove yourself. Most foreigner and foolish Bermudian have been feed the nonsense that they are better than other Bermudians.. until they themselves are kicked to the curb…and them they want Bermudians to be unified. and sadly its this “fck what anyone else says, we do what we want” arrogant BS attitude that is dragging bermuda down. Yep, I guess, as you put it, “oif they choose to strike that is their option”. Or, to put it another way, if they choose to act like idiots and get themsaelves fired that is their option. There’s about 35 Bermudians from Willowbank that want those jobs the Reefs staff walked away from. The Willowbank staff would do those jobs better, faster and with a smile – and they’d make the guests feel like kings and queens while they did it. Bermudian or not, people are just calling a spade a spade. Don’t get mad. Offer training courses to the workers in question about economics, about how to be hospitable about how to be professional about how to articulate their issues with words instead of with their feet by walking of the job. Born, raised in Bermuda ALL my life! This is not an anti bermudian rant. This is simply an observation of the public sector sense of entitlement. When ever some scrutinises their malpractice they run to the union and advocate a strike. Common man, that itself is an indictment on their actions. Be it the bus drivers,ferry team etc etc. Remember Margaret Thatcher. She killed the unions and tht was the making of Britain. It seems I see a lot these days of complaining because someone stikes or fights for something . It sounds more and more as if we need to sit back and take what ever . Listen people have a right to strike its their right. Or would you prefer them to sit back and accept everything because things are tough do you know that is just what the people in control want you to do. Think as an employer for a second. The owners are only interested in the bottom line. Does anyone say anything about the owners? allan, you are taking things to the extreme. If someone gets in a fight (and in todays climate, vigilante justice isnt too far out of the picture), but people comment saying the person should have bit their lip, kept their cool, just walked away,…. you cannot then try to justify the fight by asking “if someone was threatening my life, i should just let it happen?”…you are taking a simple issue and trying to equate it to a more serious one. thats teh same thing you do when asking if the workers should just accept what they get. No they should not always just accept it, but pick the battles. 3 people being laid off for (as far as we know) NOT an illegal reason is NOT a time to go striking. Its just not the right reason to be taking such an extreme measure.